Durga Kainthola has the rare ability to scale her artwork from miniatures to grand scales, 2D to 3D, from linear timelines to capturing the sense of an eternal moment where time itself stops. Her keen observation of the popular in today’s world juxtaposes itself with challenging notions of what should be. Her artwork forces the viewer to reconsider their opinions on beliefs created and taken for granted through the subtle and harsh visuals they are subjected to in everyday life. Through her work she challenges our preconceived notions of beauty and the value of women in our society. 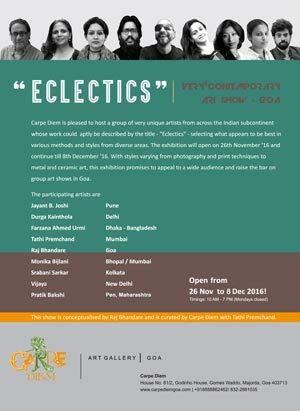 Farzana Ahmed Urmi crosses over the international border from Bangladesh to be part of this exhibition. Her work is extremely bold with lines and layers showing off her confidence even when she chooses to portray the human face in manners that common standards of beauty adhere to. With an emphasis on the feel and texture of these forms, Farzana brings in elements of the abstract and plays with multiple hues within a limited choice of colours. Her more abstract works on the other hand have seemingly endless possible forms lurking in the background leaving a lot to the imagination of the viewer. Tathi Premchand presents us with a series of drawings that highlight an intricate web between the dot and the line. And in some cases the influence of colour on a black and white canvas. With seemingly simple lines he creates patterns and forms that when viewed from afar create visual associations to the familiar and yet forces one to redefine the meaning we give to it. Tathi explores “space” in the broader infinite sense of space itself to the confines of thought processes racing through one’s mind. The intensity of ink in some places contrasts greatly with the emptiness around and as the eye moves from one point to the next, size, space and form and scale take on new meaning. Raj Bhandare’s statement as an artist speaks of the need to transcend the urge to acquire and enjoy and instead to create and revel in moments of joy and peace. His works therefore aim to uplift the viewer with light visualizations of familiar forms etched on copper plates. Common subjects such as the animals seen as sacred to intimate interactions between two human beings become subject matter for thought, reflection and entertainment. Srabani Sarkar brings to the mix a different print form of art – the woodcut. She believes that the choice of medium helps concretise something more fictional into a reality of sorts. With a keen eye and ear on current affairs and on critical social issues, she aims to capture themes of inner strength, justice to women and more. Imagery suggestive of power and toughness take centre stage and the use of wood textures serves to enhance the final visual experience. Pratik Bakshi describes his art emerging out of absolute need. His works are often not focused on a particular subject as he attempts to draw from a state that does not allow him to consciously focus on a concept or emotion and its expression. He creates a narrative by expressing composite forms with animal-human conditioning. Sexuality is a source of inspiration with symbols like the tail and phallus echoing the cyclic mystery of life. Use of charcoal, balanced with little forms and areas of colour allow for the viewer to interpret his art in a more subjective manner.